Making traditional samosa at home is not as difficult as we all think. If you follow the cooking instructions given below, you can make delicious samosas at home. Though I have used potato stuffing, you can add steamed vegetables like carrot, beans, peas along with potatoes and make vegetable samosa. I have already posted onion samosa, today we will see how to make the traditional samosa with potato filling. In a bowl mix together all purpose flour, salt and oil nicely with your finger tips.The flour should be well mixed with the oil. This is done to get crispy samosas. Then add carom seeds, water little at a time and make a stiff dough. Cover it with a damp cloth (to prevent it from drying) and let the dough rest for 20 minutes. In the meantime we will prepare the stuffing. Finely chop onions, ginger and green chilli. Heat oil in a kadai/pan, add jeera seeds, when it sizzles, add onions, ginger, green chillies and saute until onions turn transparent. Then add coriander powder, turmeric powder, chilli powder, cumin powder and salt needed. Mix well, cook for 2-3 minutes. Add cubed potatoes, coriander leaves and mix well. Switch off the flame. Add few drops of lemon juice to taste. Now our potato stuffing is ready. Now take a ball of dough and roll it out very thinly in an oval or round shape. You do not have to be too perfect. Cut it into half as shown in the picture below. Fold it in such a way that you get a cone (see picture below). First bring one edge to the center, then bring the other edge and place it overlapping the first. Now you will get a cone as shown below. Wow!! Look at the triangular shaped samosa with potato filling inside sitting beautifully. Now repeat the same process for the rest of the dough. All the samosas are sitting (pic below) waiting to be fried in oil. Now heat oil in a kadai. To check if the oil is hot enough, drop a small piece of dough into the oil, if it raises to the surface immediately, then the oil is hot enough to fry the samosas. Fry the rest of the samosas in the same way. Now you can make lovely samosas just like you get in hotels and road side stalls at your home itself. 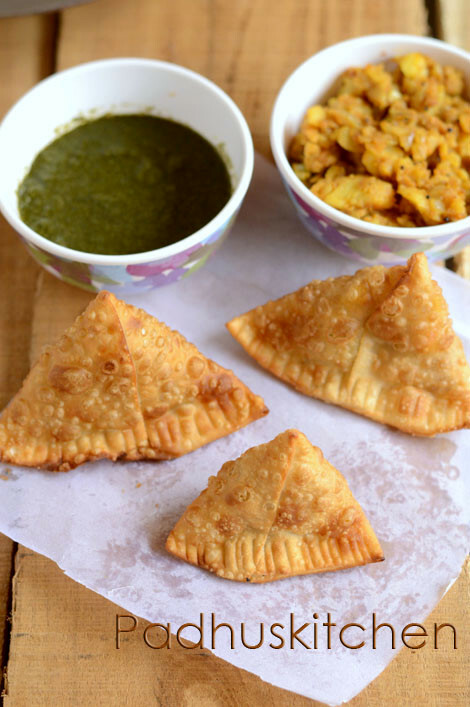 I am sure you will love my Onion Samosa Recipe with step wise pictures and cooking instructions and also my collection of Indian Snacks Recipes. Note -I have not yet tried baking samosas. Once I try it, I will update it here. Tried your onion samosa today for tea time. Came out well. Will try this next weekend. Thanks for posting step by step recipe. I am most decidedly not of Indian decent :) This is my first time making anything Indian, so I thought I would start with my restaurant favorite. Your recipe looked easy to follow! They came out really well! The dough was SUPER easy (and I hate making dough). The only problem I came across is that the filling was a little less flavorful than I was hoping and used to. Perhaps next time I will use half the potato? It did make a LOT of filling! The flavors are definitely delicious, just not strong at all. Also, my filling is very dry. Thank you so much for a successful first recipe! I can't wait to try other dishes on your blog! I tried samosa,it was a blockbuster hit.We were out of samosa to stop eating it.Thank you so much.Good luck in posting new innovative recipes. Hi I made this today. The edges were crispy but the rest of the Samosa was tough and not so crispy. Did I fry too long ? Or did I not roll the dough thin enough? Please can you give me tips on improving the crispness? Thanks! For crispy somosas, the rolled out dough should very thin. It's really a nice recipe. I tried and it came out very well! i am just a kid but i am going to try it. Am going to try it today .. Am new to cooking so for past one year I cook only ur receipes ... Keep posting ... Thanks for ur wonderful job ..
Padhuji, samosas came out very well. Our family enjoyed them with tea. I made green chutney also. That became a hit. Thanks for the recipe.